I appreciate your allusion to patterns here. I’m also wondering why it has always been reported that it was the fitted sheet of the bed Shan’ann was wrapped in and found at the Cervi site when it appears from your photos that the fitted sheet is home on the counter and it’s the flat sheet that has been recorded into evidence? A small detail, perhaps, yet potentially huge in determining the steps he took that night. I remember reading that there were several items introduced and used during the recovery process from the shallow grave. The rescue team stated they bagged the fitted sheet and used a white flat sheet they brought to wrap and lift the body. They also placed paper bags on her hands to preserve any DNA evidence. Those items were booked into evidence although they weren’t part of the original crime scene. Good point. I don’t think the sheet in the photos with the shirt is the fitted sheet. Are there other pictures of that sheet? Because that is definitely a “flat”” sheet and it appears to have a pattern on it when looked at closely. Of course, it is very blurry and not definitive. It also looks like a fitted sheet on the counter. And why wouldn’t the sheet he wrapped her in and reportedly dragged her be photographed for evidence? The sheet she was removed on would seem less vital than that original sheet for evidence. Here’s the video of them booking the sheet they used during recovery into evidence and hanging it. At 10:14, and you can see it more clearly. He says, “This is the worst one, smell wise.” I think this is the sheet the rescue team described using during the recovery effort. Thanks for sourcing this and putting the link in here, This looks to be the coroner’s sheet. It’s not the sheet found by the drone, and thus not the sheet originally used to transport Shan’ann’s body to the site. I remember when researching one of the books not being able to see any clear drag marks on this sheet. Agent Sailor said he saw dirt track patterns on the sheet, indicative of dragging. Again, it’s a different sheet. One wonders why close-ups of that sheet aren’t part of the evidence file. Agent Sailor also took close-up photos of it with his cell phone and sent it to CSA Agent Yocum for verification. Thank you, JC, you’re awesome. Always had a niggling question in my mind as to why he took the black plastic trash bags with him in the truck, if he had gone to the trouble of bagging them prior to leaving. Incriminating. Looking again at the pictures from inside the house, the fitted sheet was put in the trash, then put on the kitchen counter. The pillow cases (3) were laid out on the dining room table. That means the flat sheet was left in the field. Makes more sense that he wrapped her in the flat sheet, especially if she didn’t go to bed. The flat sheet would be the “top sheet” – if she had gone to bed and was strangled there she would have gotten under the top sheet – hence, she didn’t go to bed and was not strangled there. I think the closeup of the stains are on the pillow cases. @nickvdl I’ve read through all the books and this site extensively and find the case fascinating. One of the most enlightening things I’ve seen you say is that we can’t try and understand what Watts did in isolation, as sane and rational observers, we need to understand the complexities of his life and try and put what occured in that context. I wholeheartedly agree and especially like the way you summarise it toward the end of drilling through discovery, as a small idea that germinated in to something much, much bigger. There is something I may have missed, when looking through the site and you may well have covered it somewhere, but what’s your opinion of the ‘shadow under the truck’ theory? I’m as far from a conspiracy theorist as you can get, but I can’t see any other explanation for the shadow moving towards him other than it being one of the girls? If anyone else has any explanation for it, please do chime in! Apologies for the repost Nick, but with me not replying I figures maybe you wouldn’t get a notification. 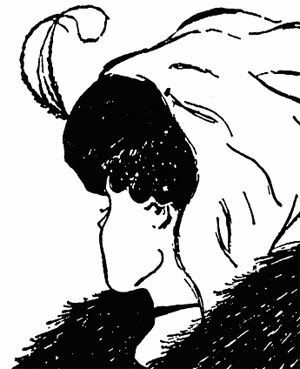 Yes the picture is an old woman or a young woman looking away? I understand that things can appear to simultaneously be two (or more things) at once, but I can’t come up with a logical reason that a shadow would move from the left of the truck, and he would come from the right of the truck and scoop it up? I even went as far as testing whether a shadow can reflect/refract off a mirrored surface (it can), but would reflect as you would expect, it wouldn’t come from the other side independently, as it clearly does. I assume you have seen the actual clip I refer to? https://www.youtube.com/watch?v=DUZfTJZxi-s at 12:45 (There is a false/incorrect clip on Youtube claiming to be the shadow clip, it isn’t). Can a clear, rational mind tell me what else I could be looking at here? I’m genuinely stumped. Matt the point is one can see not what is there but what one thinks one sees, or wants to see. Confirmation bias. Once you see something a certain way it's very difficult to unsee it. A single strange shadow in half an hour of video footage is hardly evidence of anything. If there was more to that theory, there would be more evidence. When I initially watched that video I thought a shadow moving in the foreground near a car tire was a cat lying on the ground. It turned out to be the shadow of a flag moving slightly in the breeze. If you’re committed to the idea of a child running around a crime scene in the dark, write a scenario where that makes sense. Maybe in one scenario both children are still alive, and in the other one is alive and the other dead. Keep going, and try to explain how or why if it was you, you’d transport their dead mother and how you would make sure they didn’t see her, and if they did, they/or she wouldn’t start screaming in terror and fear. Would it be worth the risk to do that? People who entertain these conjectures seems to know absolutely nothing about the criminal mind specifically, or true crime in general. Nick, I completely agree with what you say, it makes no sense. You could perhaps entertain scenarios where it could happen but as you know, the most obvious explanation is usually the correct one. I suppose I struggle by allowing emotional thinking to cloud my judgement, something you will have trained yourself (or naturally be able) to avoid as a crime writer. In fact, were it not for the lack of a bed time photo when shannan requested and the call to his co-worker to tell him that he would go out to cervi 3-19 first thing in the morning (something that was unusual but not uknown), I would still find it extremely difficult to believe he murdered his children premeditatively, rather than as an act of desperation. With regards the shadow, possibly the children were drugged and/or smothered, taken down to be loaded in the car but one of the children was only unconscious and not dead, wakes up and instinctively walks towards daddy. I’m not trying to change the narrative and I don’t disagree with much of what you say in the books, I’d just like to hear any other explanation for shadowgate, scientific or alternative? See, that’s a problem. If you can’t imagine his murdered his children premeditatively, then where does the error lie? On the one hand it’s a failure of the imagination that’s the issue here, and seeing shadows and turning that into imaginative but ridiculous breakthroughs that don’t make any sense. The post meditation of the crime, in terms of the disposal of the bodies and the calm nonchalance afterwards to the media reflects the calm, calculated premeditation running up to it. If the children’s murders were random acts of desperation after the fact, their burials would have been more rough, panicked and unfinished than Shan’ann’s. Instead, the children’s bodies were disposed of “better”, for the lack of a better term. Killing one’s own children is a taboo act, one that a parent should be ashamed of. So a lot of effort went into hiding this shameful deed. The selection of the CERVI 319 site was also a carefully premeditated effort, something he started organizing as early as Friday. The time he took off from work on Friday – he arranged that leave apparently weeks earlier. @Matt I hope you don’t mind me chiming in here. That driveway has an incline much steeper and more pronounced than most people realize – so much so that if you put your car in neutral, it would roll down into the street. I was able to think of quite a few inanimate items, both round and with wheels, that I believe would recreate this exact shadow given the same conditions (including multiple light sources from various angles). There are people a lot smarter than me though who have described various possibilities having to do with how shadows and light sources work to trick appearances. Those are interesting possibilities as well. @JC Not at all, I appreciate any insight that could debunk what I thought I saw because it’s obviously highly unlikely and also pretty grim to think about so thanks for the input. The incline is sharper than I realised, so something could indeed have rolled or moved to cast the shadow. Could you point me to the discussion of the shadows you mentioned, as YouTube comments aren’t particularly insightful as you can imagine! @nickdvl Thanks also for the reply, I suppose the issue isn’t that I can’t imagine it being premeditated, it obviously was. It’s just so hard to reconcile the good, caring father with the man who can snuff his daughters out, even with all the stressors you highlighted. I like you don’t subscribe to the monster/psychopath etc theories, just a certain personality trapped in a specific set of circumstances who did something unthinkable, I suppose that sums up why I struggle with it so much. It’s easy to call him a monster, brush it away and sleep soundly but it doesn’t advance our understanding and that’s something I appreciate this site and it’s contributors for. On another note, I’m not sure I agree with your theory about him hiding behind the pillar and watching her in the mirror, it seems far too high on the wall for him to be able to see her when she enters? just a small point, also if he grappled her to the stairs, face down as you propose, wouldn’t she have any facial/chest bruising or carpet burns? So it appeared that the problem Kodi found Friday afternoon made Chris’s choice of oil tanks for him. He knew all about those tanks; I’m sure there were lots of them that had thief hatches and could potentially be used. There had to be a reason for CW to go out there first thing in the morning at some point, by himself – and here it is. Notice how he tells KR “No sense in both of us going out there lol” to make sure he’s alone. Perhaps it was this information from Kodi that started the clock running on the murders – CW now had identified where he was going to dispose of the bodies, but only within a very narrow window Monday morning. He would have to work fast. Everything had to be completed before then. KR is now established as being out of the way; CW can proceed with his plans to dispose of the bodies. Matt take a look at the entire video again. When CW gets out of the truck the first time there is a similar shadow but he is walking a bit farther away from the truck then the time you are referencing. I have watched those videos repeatedly and do not see a child at all. I see CW bending down to pick something up and as he bends down the shadow is being cast top to bottom so it looks like it is moving forward but it is moving from his head to his back. I believe that the you-tube person who is promoting these shadows as being a child and also, NK, is just reckless. His circles of pixelated shadow closeups are just blobs of nothing but distorted shapes. I think it is wrong to use such hocus pocus voodo to make money on you tube and it is extremely poor character of him to insinuate that NK was present. That is not part of any facts that have been established and there is nothing in his video that shows anything at all except a foolhardy you tube person trying to get clicks. Yes Nick, an old woman or a young woman looking away? I understand that things can appear to simultaneously be two (or more things) at once, but I can’t come up with a logical reason that a shadow would move from the left of the truck, and he would come from the right of the truck and scoop it up? That’s definitely weird, Matt. The shadow coming from the left is a little jerky, as if it could be from something being carried. Then Chris comes into frame from the right, bends down as if to pick something up and then turns back toward the truck in a very smooth motion as if whatever he picked up was very light. Could it have been something that was set on the truck that blew down, like a sheet or a trash bag, whose shadow showed it slowly falling, slow enough that Chris could scoop it up like that? Also, notice at 7:20 – Chris is wearing white tennis shoes at this point. I somehow had in my mind that he had those boots on (one pant leg in, one pant leg out) this whole time. Thanks for the link. Yes Ralph it could definitely be something falling off the truck, it may also be the can he tried to put in the truck previously and then removed. I know i’m giving this too much thought but if you slow it down his head doesn’t really dip below the truck line so he can’t be picking something small off the floor. One of the books addressed why she had no wounds/carpet burns. Maybe you scrolled past that part. Possibly, I devoured all five books in five days while pretending to be working so there’s a good chance I may have forgotten quite a bit as it’s a lot of information to absorb in a short time. I read them cover to cover so don’t think I would have scrolled past it though. Well I did specifically address the grip and why she would not have carpet burns. You don’t have to agree. It’s simlly a theory. I’d prefer not to discuss conspiracy theories at this site Matt. There’s enough we don’t know or aren’t sure about without getting into that stuff. If you have questions I’m very confident the legions commenting on these conspiracies below the videos will have plenty of handy answers. I don’t and if I did you probably wouldn’t like them. I really don’t want to encourage that kind of speculation at TCRS. I appreciate that Nick and will avoid discussing conspiracy theories and shadows lol. Does anyone know if the cops ever read Chris Watts his Miranda warning?